You can buy a packet of Musselburgh (or similar) leek seeds for 99p and that packet will contain approximately 750 seeds. Those seeds, if stored in cool dry conditions, will easily keep for four years. Now that's a real value for money vegetable. Enough for four years with some left over for friends at less than a pound! Other attributes of leeks include, they are easy to grow, suffer from few diseases and they produce a crop from November (earlier if you want) through to March / April when very little else is growing. Before using the calendar below, have you adjusted it to the weather conditions in your area? If not click here to do that. The calendar below be correct for your area and all dates in this site will also be adjusted. Your setting will last for six months or more and still be set when you revisit this site. If you prefer not to adjust the dates they will be the average for the UK. The objective behind this method is to grow small leeks which will be ready for eating in July / August. The cheapest and most reliable method of producing a late autumn to early spring crop of leeks. 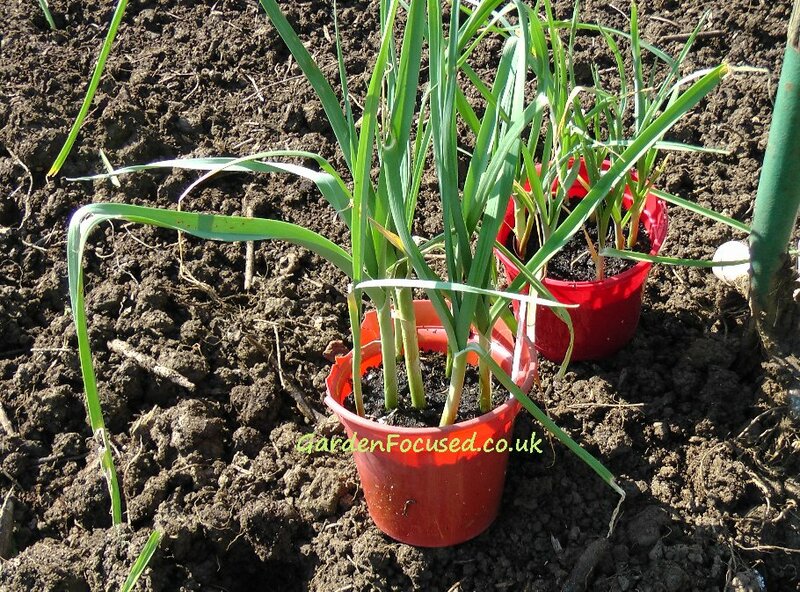 The leeks are either sown in containers or in the open ground. Around June time they are transplanted to their final positions in open ground. Also a very reliable method and definitely the easiest. They are planted in situ and left to grow for a late autumn to early spring harvest. One of the best known of varieties with very strong looking plants. Click here for much more detailed information on Musselburgh leeks. This variety was awarded an AGM in 2009 and is still probably the best autumn leek variety. The white part of the stem is thick and long and it keep well to at least March. This is an F1 variety so although the seed heads look spectacular they will not come true to type. Another excellent leek variety with an AGM award. Long white stems, it keeps supremely well and has attractive dark green-blue foliage. Easy to grow, it produces large leeks. Leek seeds will germinate in a very wide range of temperatures, from 7.5°C to 32°C (45°F to 90°F). The optimum for germination is a daytime temperature of about 21°C (70°F) and several degrees lower at night. Bear these temperatures in mind when choosing one of the three cultural methods below. 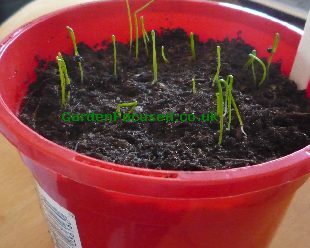 When leeks have germinated they will sprout grass like growth above ground and from this stage onwards lower temperatures (within reason) will not greatly affect their growth. Leeks are part of the onion family and it's essential that they are not planted in the same soil every year. A three or four year rotation plan should be sufficient to avoid any build up of pests. For details of a suggested crop rotation plan, click here. It's no surprise that a well-drained soil which has lots of nutrients in it is best for leeks. However, if your soil is far from ideal then leeks are one vegetable which will make the best of the conditions it is planted in. They will be in the soil over winter so a water-logged site will definitely be a problem and need improvement. A full sun position is best although leeks can still be grown well in partial shade. Choose a sunny site and dig it over well adding lots of organic matter to the soil, this is best done a month or so before the seed is sown but it's not critical. Remove as many stones as possible so that the leeks can grow long and straight without any obstructions. When you are digging, add a long lasting fertiliser such as blood, fish and bone (a good handful sprinkled over every square metre / yard). 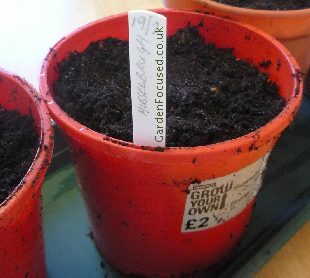 Leek seed can be sown in pots under glass / indoors during winter (method 1 in the calendar above) or directly in the ground in spring (method 2 in the calendar above). Sow leeks under glass / indoors in the first week to second weeks of February. Leek seeds can be sown in individual pots or in seed trays, it really depends on the space you have available to grow them on and how many you want to grow. We recommend growing them in pots because seed trays are not normally deep enough to allow the roots to grow to their full extent up to the time they can be transplanted outside. 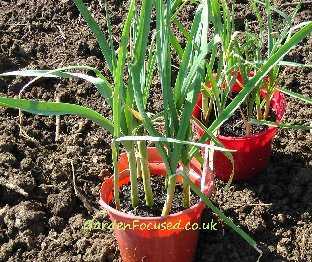 You need the pot to be 15cm /6in deep or more and each leek seedling will eventually be thinned out to 2.5cm / 1in apart. So if your pot width is 10cm / 4in you will be able to thin the seedlings to four in a pot, larger pots can be used to grow larger numbers of seedlings. Fill each pot with standard potting compost to about 2cm (¾in) from the top and gently firm the compost down. Water the pots by placing them in a shallow container with 2cm / 1in or so of water. Evenly sow the seeds on the surface of the compost and then sprinkle another 1cm (¼in) of compost over the top. 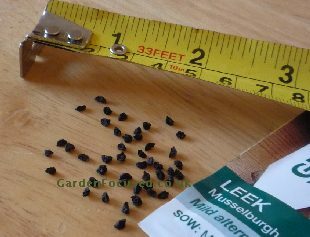 Leek seeds are small but still large enough to handle individually (see picture below). Sow about twice the number of seeds as the pot will eventually accommodate. For example a a 10cm / 4in wide pot will eventually be thinned to four seedlings therefore you will need to sow about eight seeds - for a 20cm / 8in pot sow 16 seeds and so on. You can sow more seeds per pot but you will only be making work for yourself because they will need to be thinned out later. Place the pots in a warmish place, 16°C to 21°C (60°F to 70°F) during the day and slightly cooler at night. At this stage it's not important if the pots are in light or dark. 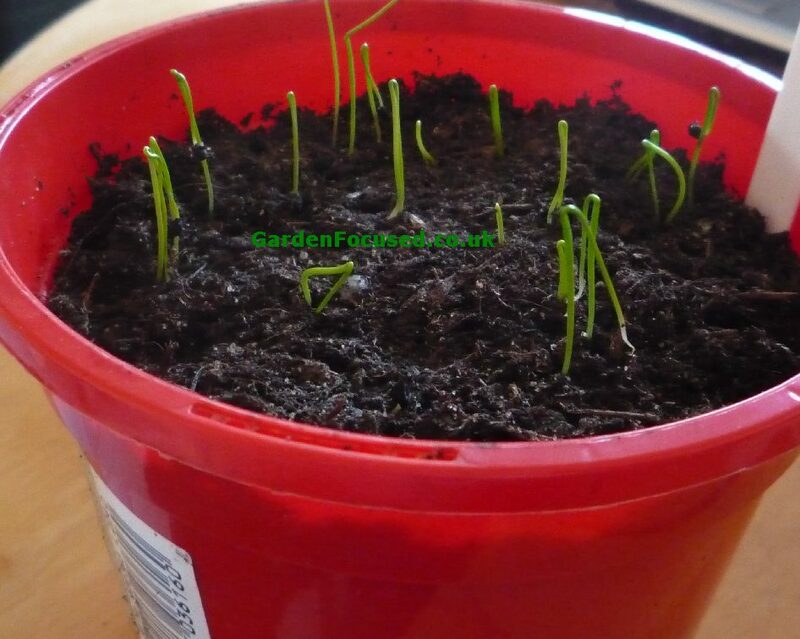 Leek seedlings take from 10 to 14 days to germinate. When they do germinate they will appear above the surface looking like blades of grass. You can expect most of the seeds to germinate. As soon as the seedlings appear move the pots to a position with lots of light. If you have sown the seed in a seed tray, thin the seedlings to 2cm (¾in) apart to avoid overcrowding. At this stage of their life up to the point when you begin to harden them off, a temperature range of 13°C to 18°C (55°F to 65°F) is ideal but leeks are very tolerant of temperature. Keep the soil moist but not waterlogged. Every couple of weeks water with a general purpose liquid feed at the recommended rate on the pack. When the seedlings are about 3cm / 1in high (see picture above) thin out the seedlings so that they are about 2cm apart. Sow leeks outside in the second week of April. When sowing leek seed outside the best method is to sow them in a seed bed where they can grow for the first few months of their life and then transfer them to their final position. Seeds sown in a seed bed are spaced much closer compared to their final positions. The main advantage of this method is that up to June, the leeks take up much less room allowing other crops such as lettuce to be grown early in the year in the unoccupied space. The second advantage is that when you transplant the young leeks from the seed bed to their final position they can be planted in a manner which reduces the risk of soil becoming embedded in the growing leeks. It is quite possible to sow leek seed in their final position and miss out on the transplant stage. 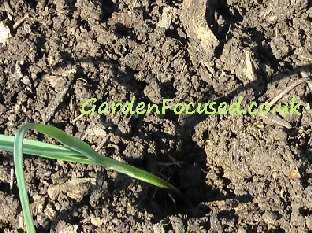 To sow leek seed in a seed bed draw a straight line in the soil (use a pencil or plant marker) about 1cm (¼in) deep. Sow the seeds in the line, one seed every 2cm (¾in) and sprinkle over some fine soil or potting compost. Firm the soil down gently. Rows of seed should be spaced 10cm / 4in apart. Water well with fine spray and keep the area moist if the weather is dry. The seedlings will emerge in about 14 to 20 days time and they will look like blades of grass. When they do appear, water with a general purpose liquid fertiliser (see pack for the recommended dosage rate). Keep the soil bed moist but not waterlogged. Every two weeks repeat the application of general purpose liquid fertiliser. The process for planting winter sown and spring sown leeks (as well as small leek plants bought in garden centres) is exactly the same as described below. However, winter sown leeks will need to be hardened off before planting outside. Winter sown leeks should be ready for transplanting in the first to second weeks of May 2017 whereas spring sown leeks will be ready for transplanting in the first week of June. Growing conditions will differ each year so the above dates are approximate. The other method for judging when to transplant leeks is when they are about the width of a knitting needle or pencil. Ideally they should also be about 20cm (8in) tall. See the picture below which can be enlarged by clicking on it. Plant your leeks in rows which are 40cm / 16in apart with the spacing between each plant 15cm / 6in. If you want very large individual leeks increase the spacing between plants. 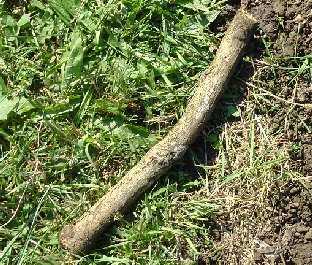 For each plant make a hole in the soil to a depth of 15cm /6in using a dibber (rounded piece of wood about 3cm / 1¼in wide). 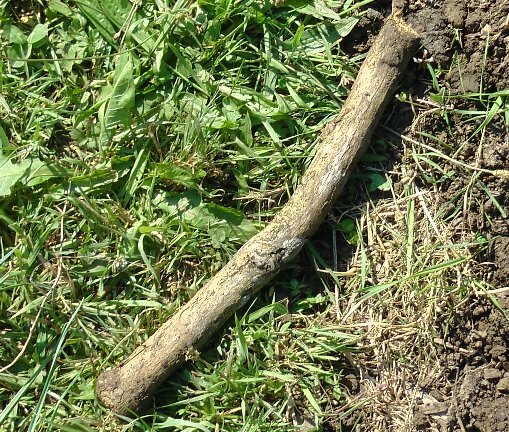 Many articles suggest using the handle of a broken spade or fork but we have desperately been waiting for fifteen years for ours to break without luck! Drop the leek into the hole (roots downwards) and gently settle it into the base of the hole. Fill the hole with water, this will cause just enough soil to cover the roots and at the same time ensure the soil is fully watered. Don't fill in with soil, the plants will be fine as they are. Many books and websites recommend trimming the roots and the tops of leeks just before planting them but they never have any research which indicates whether this is good for the plants or not. After years of my own research I can confirm that trimmed or not they all the grow the same. So do yourself a favour and save yourself the trouble of trimming them, it's just an unnecessary job. Leeks need moist (but not water-logged) soil throughout their life. The roots are very shallow and the plants quickly suffer in dry conditions. So keep an eye on them and water in dry periods. Weed the area around the plants to prevent competition for water and nutrients. A couple of weeks after planting, feed the plants with a liquid general purpose fertiliser. Feed again a couple of weeks later with a long-lasting fertiliser such as bonemeal or blood, fish and bone (a good handful per square metre / yard). The tastiest part of a leek is the lower white part of the stem although the green top part can also be used. To increase the length of the white part of the stem (a process called blanching) you will need to earth up around the stem. 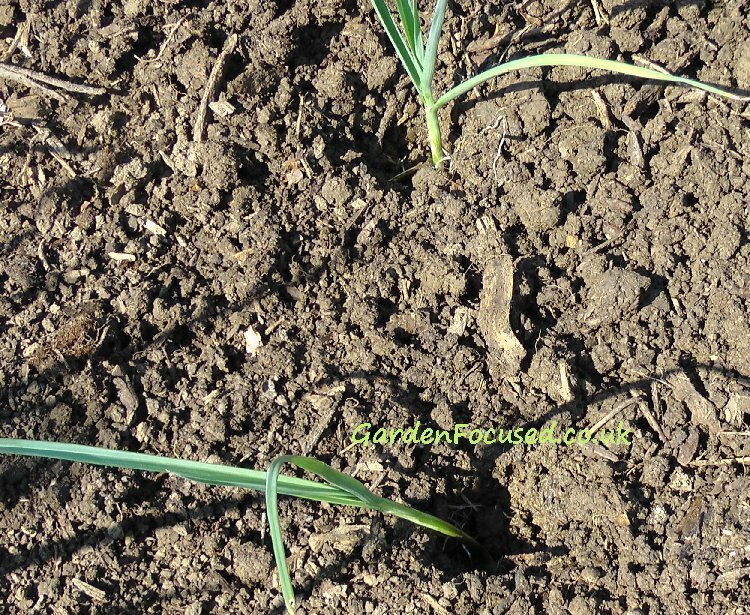 Earthing up is simply dragging soil from nearby so that creates a mound of soil around the stem of the leek. By drawing up soil around the stem as the plant grows you are excluding light from getting at the stem which effectively keeps it white. It is important to do this in stages because you want to avoid any getting any earth between the leaves and the stem. Begin the blanching process in the third week of August and continue it for the next month or so as the leeks grow taller. If you use the process described above be careful not to earth up the soil too far because earth and small pieces of grit can get lodged between the growing leaves which makes cleaning the leeks for cooking a problem. An alternative to earthing up (or in addition to it) is to cover the lower part of the growing stem with cardboard (often the centre tube of a toilet roll is used) or a pipe insulator. This also excludes light and encourages a longer length of white stem to grow. Winter sown leeks can start to be harvested from the second week of August onwards. Spring sown leeks can be harvested from the last week of October onwards right through to March the next year. Don't be tempted to harvest leeks by simply pulling them up, they are very likely to break if you do it that way. Use a fork near their base to gradually loosen the soil around the roots and lift rather than pull. It can be tricky to do without damaging nearby plants. Despite being in the ground for a very long time leeks have an enviably good level of disease and pest resistance. Crucial to keeping them healthy is crop rotation, including them in the onion family of crops. The leek moth attacks leaves and the stem of leeks. Tiny pin prick holes with lines of light brown marking on the younger leaves are sure signs that the plants are being attacked. Leaves over two months old are rarely attacked. Click here for full details about identifying and treating leek moth. The first problem you will probably notice is that the leaves becomes distorted and don't grow in the normal straight and upwards manner, some leaves will lie on the ground. If you look ..... light green / grey marks on it in rows down the foliage ..... the pupae themselves which are initially creamy coloured, later on brown, and about 5mm long. They have no head section and have no legs ...... Click here to go to the full article about Allium Leaf Miner. Allium Rust attacks many plants and leeks are often affected. It's one of the easiest fungal infections to identify, leaves have lots of raised reddy-brown or yellow spots on them. Click here for our in-depth article on how to prevent and minimise the affect of this disease. This is a serious infection which will stay in the soil for many years. The leaves will randomly start to turn yellow and will become loose where they join the main stem. The entire plant may wilt. To check out if it really is onion rot, remove the entire plant from the soil (it will need to be dug up) and examine the base of the leek where the roots are. If it is onion rot the base of the plant will have started to rot, there may well be white fluffy material at the base and in bad cases parts will have turned into black spots. There is no cure for onion rot, all traces of the plant should be removed and thoroughly burnt. The soil will be unusable for any plants of the onion family for about eight years because this is a soil borne disease. Because this is a disease carried in the soil, prevention consists of not importing infected soil into your garden or allotment. This often occurs by infected soil sticking to your boots and those of anyone visiting your garden or allotment. Our quick and easy Leek and Potato Soup recipe will bring out the flavour of your home grown leeks deliciously. To date we have cooked this soup, from the recipe we give, more than ten times so you can rest assured, it is correct. There are many recipes using leeks on the internet and in books. In general though they can be substituted for onions in most recipes where you want a more subtle onion flavour.